16" Sloped Shoulder Dress Hangers w/Bar are a smart economical way to display retail clothing coordinates and lightweight suits. Constructed from molded plastic these hangers are designed to be reused or given away with the clothing purchase. 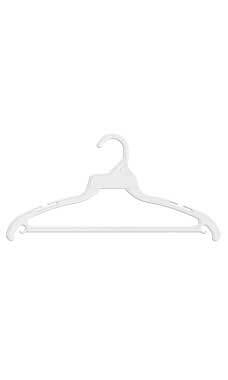 All the hanger styles feature a fixed hanger hook. Notched shoulders are standard for securing straps on dress hanger styles.